SHRINKAGE! There is less print in the world. Deal with it. Darwin called it “Survival of the Fittest.” Your biz, and the communications you produce or create have to be optimized for effectiveness at all times, or you will become extinct. SAVE A TREE? Psst… if you are in the industry and send me an email with a message encouraging me NOT to print it, you may need to review your job description. I certainly agree with printing responsibly to conserve all the resources involved, but PLEASE share facts, not myths. Two Sides North America (and their 13 global offices) have tons of #Paperfacts for you – including suggestions for those emails messages. Click. Share. Support the TRUTH about paper. TRADE SHOW MANIA! Any industry event where people gather to learn about print, and from each other, is a worthy endeavor. Too many or not enough, too far away or always in the same place, new or old, larger or smaller… pick the ones that work for you and leave the drama to your mama. Support the orgs and companies behind the shows you like, and the suppliers who exhibit there. Industry shows and events invest in YOU, attendees. Invest some time back in them on the floor and in the sessions. Follow along on social and share info when you can’t attend. You may end up helping your connections in the process of making new ones. INFLUENCERS! I’m early on this one, but “influencer” joins “guru” as something you don’t want to call yourself in your bios and social profiles. This is especially true if you have NO audience that you allegedly have influence over; possibly worse if you have a large audience of completely irrelevant people. Don’t forget social streams and followers are searchable. File this under reputation management. It matters. Sure, you provide customer service, but what is the experience of working with you? Perhaps you are creating print materials. What is the experience of the recipient or consumer? Do you know the answers to those questions? The mission for 2018 is not only knowing those answers, but defining, directing and executing the print experience. START FROM THE BEGINNING. It’s a new year. Reach out to your clients who need the most help and set up strategy meetings. Find out as much as you can about their mission for 2018. Set a follow-up meeting and bring everything you can produce within that customers’ normal budget range, that also aligns with their goals. Show them new applications and substrates. Provide estimated pricing for these items based on that customers’ normal quantity range. Take this model up your customer list. The experience of you as STRATEGIST vs. salesperson will have long-lasting effect. Who would you rather talk to? FULL DISCLOSURE. Oddly enough, I am coming across more printers and suppliers who feel that sharing knowledge and capabilities on their websites is dangerous to their business. My feeling is this… if your competitors don’t already know everything about what you do, how you do it, what you charge, who you do it for and who is making it happen on your end, they aren’t your competition. The experience of your website should be comprehensive and as human as possible. Share it all! Get the clients you work for, and the people you work with, to tell your story through their experience with you, don’t just focus on the results. How you do business counts, too. MANNERS MATTER. Without going on more than is needed, PLEASE ensure your workplace is not a hostile environment. Think twice about booth babes, and endeavors that could potentially make anyone uncomfortable, or assume the worst about your company culture. Every experience with your business, whether under your roof or out in the street, should be impeccable and respectful to all. Amen. TOUCHY FEELY. This one gets some audio support. Both these performaces are around the same time, and yes they are from the 70’s but that isnt what matters… the experience is what matters. That is ink on paper. It’s nice, relaxing, minimal distractions. It does a great job communicating a message. It doesn’t need a fancy bass line or drum solo. The foundation of words and melody – like ink on paper – is solid and serves to hold the emotional experience of what is being communicated. That is ink on paper… PLUS. From the first electricfied power chord It draws you in. It captures your attention, actually it demands your attention! Even if you drifted off before the 10 minute jam ended, I will bet more of you listened longer to Mr. Nugent than Mr. Carmen. Those moments count in marketing. 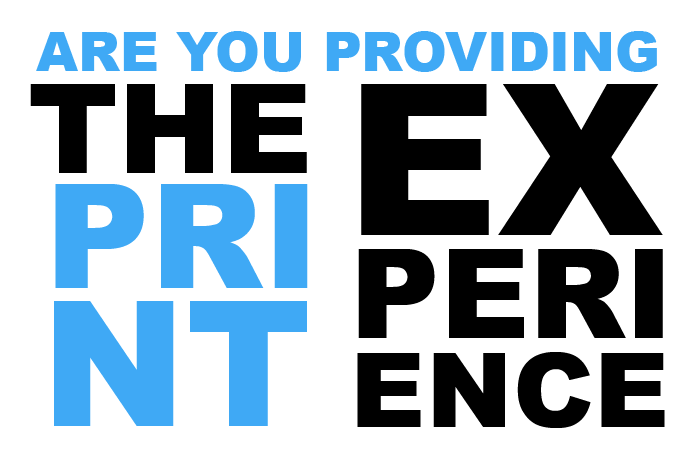 Is your print topping the experience charts? Are you incorporating new techniques and substrates into your materials? Do they shine and pop? Talk? Light up? Smell? Provide a bridge to a digital experience? Are they #SCODIFIED!?!?! If you want to get inducted into the print Hall of Fame you have to create a library of meaningful work, that rocks. After all, which song made you want to crank up the volume and flick your Bic? HEY HEY, MY MY. So yeah, I had an epiphany listening to the radio recently. Conclusion: Print is Rock and Roll! It’s disruptive, always evolving, part of the history and culture of this world. It’s a tool for communication, education and social change. Print provides marketers a solid foundation to build upon, just like the hooks from the rock world provide a foundation for DJ’s and artists in other music genres to build upon. Even elevator muzak has roots in rock and roll. The print you create, the print you produce, the print you sell, the print you receive – should ALL go to 11 and be lighter-worthy. Provide a front row concert “PRINTSPERIENCE” … Every. Single. Time. ROCK ON LONG AND PROSPER! PS… in case you missed the BIG news: WE HAVE LIFT OFF! 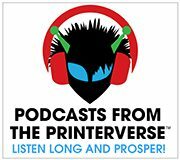 Podcasts from The Printerverse has landed! What great insight you display. Well said.